Although its name indicates that it is found only in cornfields, the cornfield ant is frequently found nesting in lawns; under stones, bricks, and sidewalks; and in or under rotting wood, bark, or logs. The cornfield ant is, in general, a very common outdoor ant. is found across North America, except in the extreme south and southwest. varies in size, from as small as 1/10 inch up to 1/4 inch long. maybe black, brown, red or any or all of these colors. emits an acrid odor when crushed. seek out moisture, including that of damaged and decaying wood. is called the cornfield ant because it is known for hatching the corn root aphid and transferring it from grasses to growing corn, according to Wisconsin Natural Resources magazine from the Wisconsin Department of Natural Resources. Like the field ant, this ant feeds primarily on honeydew of aphids, nectar, and seeds, as well as on live or dead insects. 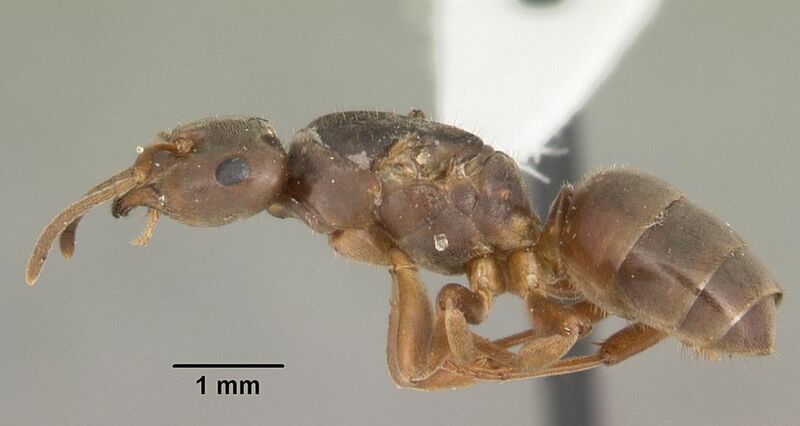 It may, sometimes enter homes in search of food – particularly sweets, however, rarely will this ant ever be found nesting within a home or other structure. Cornfield ants will build their nests in the exposed ground, with the mounds sometimes reaching exceptional dimensions and heights. It is sometimes confused with the carpenter ant, but since it is much less likely to enter homes, it needn't be a concern – particularly if it is found very far from the home. If a cornfield ant is found in the home, it is likely to be indicative of a moisture problem, and the source should be found and corrected. This ant is sometimes a secondary pest, found to inhabit the galleries of carpenter ants that have been eliminated if the wood is not replaced or repaired. Their presence can then cause further deterioration of the wood. This ant may bite, but generally causes little more than itching or slight stinging. Its nesting can cause small "craters" in the lawn, garden, or planter boxes. Because this ant rarely comes indoors and does not nest inside buildings, the most effective control efforts will be those that incorporate baits and are aimed at the nest. The Wisconsin Natural Resources magazine notes that the use of a commercial bait or boric acid plus peanut butter and honey may be effective. Other sugar baits can also be effective for this ant. How Do You Find an Ant Scent Trail?